Who wouldn’t want to talk with a professional “idea whisperer?” That perfectly describes Tamsen Webster — she helps people find, build and tell the stories of their ideas. As a message strategist, former executive producer of TEDx Cambridge, and founder of Red Thread™, she’s also a highly sought-after consultant and globe-hopping keynote speaker. We sat down with Tamsen to talk through her approach to creating compelling ideas and messages in a recent video interview. You can watch the interview video, or start by reading the major takeaways excerpted below to pique your interest. Q. What is the Red Thread and how did it originate? A. About five years ago I was asked to become the executive producer of TEDx Cambridge where I needed to teach others how to do what my brain did so that presenters could write their own talks. I always just kind of knew how to find the energy or power of a message that made it make sense, but now I needed to break it down and figure out what the components were that I learned over time that helped me craft a message that made it compelling. I didn’t have a name for it at the time, but I was working with a client from Sweden and she used the phrase “Red Thread” to refer to the meaning of something or the theme that made it all make sense. I realized that’s what I was trying to do with this process. In one way, the origin of the Red Thread goes way back to Greek Mythology and the story of Theseus and the Minotaur. The red thread traced his way back out of Minotaur’s labyrinth or maze and Theseus was able to rescue himself, similarly to Hansel and Grettle with their breadcrumbs. The Red Thread concept is kind of how my brain works. When working with a client to figure out how to express an idea, I’m basically helping them retrace the steps that brought them to that idea in the first place. That’s the secret to transferring ideas from one entity to another. Q. It sounds like marketing anthropology. A. That’s funny because my mother was an anthropologist! I hadn’t thought of it that way before! Q. I was struck by your promise that you help people see. I’d love to hear more about that. I see what I do as opening a control window so we can look at the commands running in the background. While how an individual fulfills them are different, the commands are the same. How we see the world is formed by the same story structure, but we always try to create a story out of what we see. If we can understand that internal story code in our minds and fill in the blanks, we can start to really see what’s going on. It’s powerful to see individuals and organizations pull back to discover why we do things. The why is shaped by the deeper level, foundational principles that we all share. Q. So it starts with a common understanding of the goal, an illustration of the problem and the ideas behind that; then leading people toward self-discovery of the actions that can bring about change? A. When you think about how the brain processes information, especially when it comes to changing one’s thinking or behavior, those pieces all have to be there. But someone has to understand the perspective they’ve taken and embrace a new one in order for change to happen. For example, a lot of people who want to get healthier know they need to eat less and move more, right? They know the problem and they know the solution. So why do some people not get it or experience success? Generally, we know there’s a certain number associated with daily goals for weight loss, as with Weight Watchers’ points. It’s about keeping track. But certain Weight Watchers members saw themselves as “night eaters” and would eat a lot of their points later in the day and they’d run out of points. They said, “I’m great in the morning or afternoon, but it’s the nights that sabotage me. I don’t know if I can ever overcome that.” The new perspective I gave them on their problem was that their daily number of points didn’t have to go from morning until night. It’s 24 hours of points, right? So, why not start those points with dinner? Sounds simple, but their minds were blown. They were so “in it” that they couldn’t “see it.” That same mind shift can map across so many other areas. When we talk with a customer, a lot of times we can look at their situation and easily point out a new perspective and approach that they simply can’t see because of how they’ve always looked at it. The new perspective may be simple, but that doesn’t mean it’s easy. Just like working with a computer, you can’t see the underlying code to understand why it works the way it does; you’ve just always relied on what you see on the surface. Once you get it, it’s extraordinarily powerful as a process for building new messages, decoding why others aren’t working, and inventing new directions you can go with your messaging, products and services. Q. If you were making one bold promise to Experience Inbound attendees about what they can expect when listening to your presentation, what would it be? A. My big promise is that they will understand how to identify what makes an idea or message strong and how to decode why the message they have may or may not be working as well as they want it to. 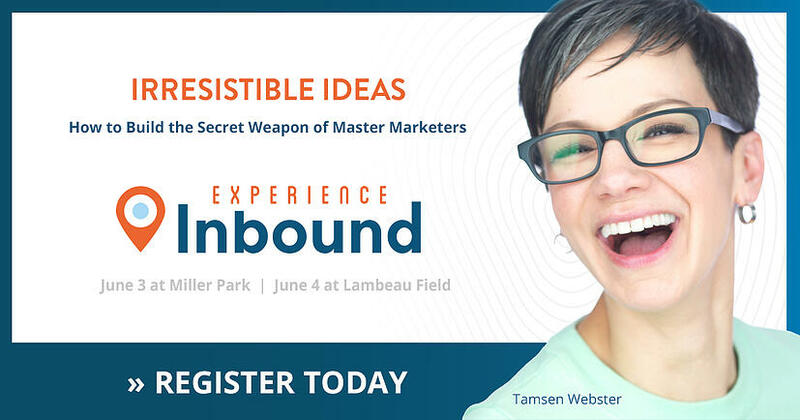 Don’t miss Tamsen’s compelling and interactive keynote address at Experience Inbound, the Midwest’s premier inbound marketing and sales conference. You’ll learn more about the Red Thread methodology and how to apply it to your marketing efforts. Click the link below for all the details on additional topics and presenters. With 18+ years in senior management roles at Fortune 500® and medium-sized companies, Greg has deep marketing and sales experience with CPGs and manufacturing. He leads strategic initiatives with clients and is involved in developing client inbound marketing plans. Greg holds an M.B.A. from Northwestern's Kellogg School of Management and a B.A. in Economics from Lawrence University.